Today on the blog I am bringing you the first of what I hope will be many 'Pinup Q&A's'. The first one is with the wonderful Vintage Doll Laura, a UK based Pinup Girl from London. I had the pleasure of meeting up with Laura a few weeks ago in Hemsby, so I thought she would be the perfect candidate to start my Q&A series with! As you may well know, Laura is a model and a YouTuber with her own channel dedicated to clothing reviews, hauls and tutorials. But if you have not heard of Laura before, read on to find out a little bit more about her! I have always loved the music since I was a little kid. My mum used to blast Elvis on the CD player in the kitchen (she still does Ha Ha!). So ever since then I wanted to know more about the pinup style and Rockabilly scene. I started to dress more pinup after my Scene Kid/Gothic stage right when I was around 18 and ever since then I feel like this is my true style. I love the music and the classic pinup and rockabilly look. I started my modelling career back at the end of 2013. I had to have an operation on my nose called a Septoplasty (I had a badly deviated septum and this was the procedure to fix it). It got so bad I couldn't breath through my nose and would often wake up in the night gasping for my breath. It was during the 2 weeks I had to take off from work to recover from the op that I started to practice my pinup hair and makeup! As I was just at home doing nothing othewise! I got Instagram just before my op and that is where it all kicked off for me and that is when I got noticed by a company who asked me if I would be in their Pin-up Calendar (I got to be month October whoop!). I also got to go to events with them around the UK and promote them. That is when I started to do more photo shoots as I would get asked more and more by people/photographers from Instagram to model for them! I could not believe it as I never thought I would be, as some may say 'model material', but that did not stop me! I also signed up to this website called Purpleport which is a site for models to get work and that is how I landed the job of modelling for Hell Bunny clothing for one of their seasons. It was a super cool experience but I was super shy! I really did enjoy it. I have to say I do love all the looks but nothing beats the classic pinup look! Red lips, winged liner, pin curled hair; such a classic style! I would say my style is a mix of both the classic and rockabilly looks. I like to look classic with a touch of bad girl vibes! When did you do your first photoshoot and who was it with? My first photoshoot apart from the calendar I did was with John Bellingham (@portraitsandpinups on instagram). I remember talking to him on Purpleport about doing a pinup shoot and then he mentioned about doing the shoot at his camera club he was part of at the time. I remember there was him and about 7 other photographers and 1 other model and it was super fun. I can't remember where the location was as it was so long ago now but I remember it being cold outside! We did some outdoor shots as well as indoor. That's how me and John met. We are still great friends and often have photo shoots together still! He is an amazing photographer and friend. What was it like doing your first photo shoot? I remember being very shy and not really knowing what I was doing but I soon got into it and found I really had a passion for it later on. I feel everyone is nervous on their first photo shoot (I know I was). It was so new to me but I got told I was a natural at it and that's when I realised I really loved doing it. What is your favourite vintage event? I love the Enfield Pageant of Motoring! It is one of my all time fave events! Last year I even got to be the poster girl for the event. My face was on the flyers so that was real cool! I have more events yet to go to! This year will be my first time going to Atomic vintage fest! Really looking forward to be going with my boyfriend Drew. I like almost every kind of music as growing up in the 90's and it now being 2016. POP music is everywhere but it's defo not my fave! Now this is a hard one! I have way too many faves! But I will narrow it down to my top 3. I love the movie Cry Baby staring Johnny Depp when he was young! I also love Some Like it Hot with Marilyn Monroe. It's a black and white movie but I really love it! And last has to be an Elvis film! I love him in It Happened at the World's Fair! Such a great film! Now this is an easy one! I love pizza; my fave food of all time! I would travel back to the 1950's to go and see Elvis perform! If only someone would invent a time machine already! What is the best part about being a pinup? There are so many great things about being a pinup girl. I love all the clothes I get to wear and all of the people I meet. The scene is a great place to meet new friends. You have lots of tattoos - which one is your favourite? I love all of my tattoos and have a few faves but the two I love the most are the one on my right ankle of a black and white unicorn head. My sister Jo actually drew it for me one day and I loved it so much I decided to get it tattooed. The other one I really love is one of my newer tattoos I got while I was in Hemsby a few weeks ago! I got a saying and some flowers on my left arm. It say's "Yesterday is history, tomorrow is a mystery, but today is a gift". I got it to cover up a nasty scar I have just under my wrist from my past. I love these tattoos so much! I do love Bettie Page! She was the ultimate pinup girl back in the day! I also love the amazing Dita Von Teese & Bernie Dexter. All flawless ladies! Oooh! I have so many! 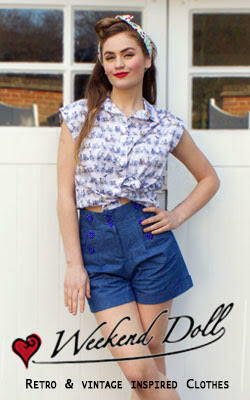 I love Collectif clothing, Lindy Bop & Banned clothings new Dancing Days collection! 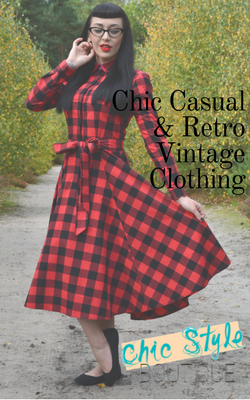 These brands are amazing for pinup clothing and all have great sales too! I love so many more and could ramble on for ages talking about them! What I say to anyone starting out in the pinup style or rockabilly scene is that everyone is friendly in this community and we always welcome new comers with open arms. Also, if you are starting up as a pinup girl and are not sure about hair styles or how to do them you can always search YouTube 'How To' videos on certain hair styles and pinup make up. If you are a pinup girl and want to get into modelling I suggest maybe getting some professional images taken and go from there. So there you have it! If you have any questions for Laura, please pop them in the comments box below!